The Xperia XZ3 that Amazon is selling sports a 6.0" 1440p P-OLED display, a Snapdragon 845, 4GB of RAM, 64GB of storage, a 19MP Motion Eye rear camera, a 13MP front-facing camera, and a 3,330mAh battery. It's the first phone to ship with Android 9 Pie, and it also has dual front-facing speakers, super slow-motion in 1080p, IP65/68 water resistance, and Qi wireless charging. 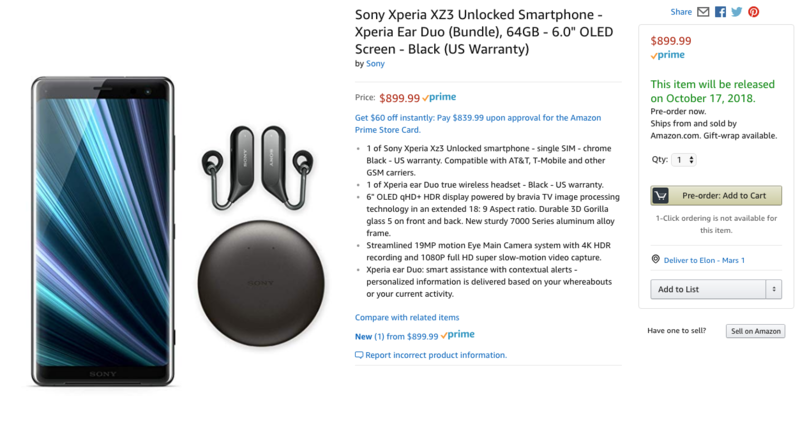 If you're planning on pre-ordering, buy from this Amazon link to get the free Xperia Ear Duo earphones (which are $279.99 on their own). Unfortunately, only the black color is available with the freebie; Forest Green and White Silver also cost $899.99, but the Xperia Ear Duo isn't mentioned in either listing. The Sony Xperia XZ3 is now available to purchase at Best Buy too — Black, Forest Green, White Silver — but there's no free Xperia Ear Duo if you get it there. The $899.99 price is the same as Amazon. At B&H, Focus, and elsewhere, it's still only up for pre-order, though that will surely change soon.